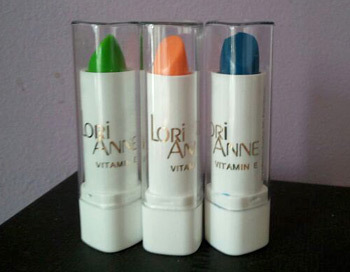 Lip Gloss in the 80s: Pucker up, Buttercup! | Like Totally 80s Lip Gloss in the 80s: Pucker up, Buttercup! 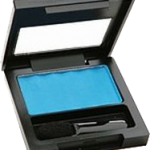 Lip Gloss: Pucker up, Buttercup! 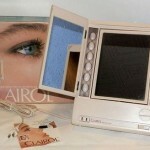 Home » 80s Makeup » Lip Gloss: Pucker up, Buttercup! 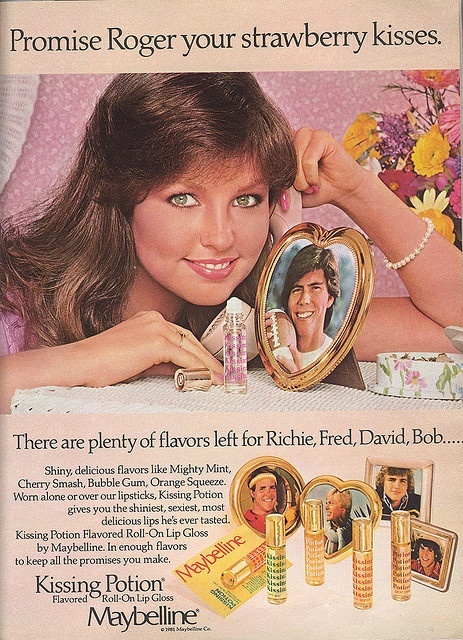 Before we were allowed to wear actual makeup, girls of the 80s loved their flavored and tinted lip glosses. We stowed them in our purses, because periodic reapplication was a must. Those sheer colors and glossy shines didn’t last for long. But that was TOTALLY okay, because these luscious glosses were sweet treats as well! A little hit of Dr. Pepper or strawberry lip gloss was just as yummy as a mouthful of Nerds or Pixy Stix, but it was something you could indulge in at, like, your desk in homeroom. MMMM! This was delish. Like its soda namesake, Dr. Pepper lip balm was a mysterious taste hybrid, sorta like a cola, and sorta like a root beer. Whatever, it tasted great and softed our lips nicely. 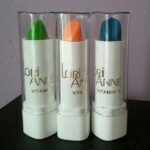 Color and shine, not so much, but this lip gloss’ great flavor more than made up for that. Bonne Bell produced balms flavored like sodas (such as 7Up, Orange Crush, and Hires Root Beer) and candy (including Tootsie Roll and Good and Plenty), but Dr Pepper was the most popular. 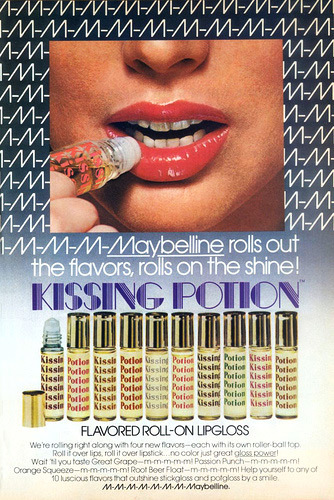 Kissing Potion glosses were in liquid form with roller ball applicators. They were clear and super shiny, and oh-so-yummy. 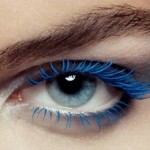 Equate them to licking a Dum Dum and rubbing it on your lips, only with less color and slightly longer-lasting shine. Of COURSE little girls were going to dig them. Add to that the idea that maybe – just maybe – your crush might notice your extra shiny lips and get the idea to go in for a smooch, and you’ve got one bitchin’ lip gloss, ladies. Could this be Deborah Foreman of ‘Valley Girl’ fame? The ad above features the lovely Deborah Foreman of ‘Valley Girl.’ While the rest of the ad is 80s to the max, who else thinks that the names used for her potential kissing partners shows the age of the ad’s copywriter? Fred? Bob? Come on. Our 80s guys were named Jason, Keith, and Todd. Village Lip Lickers came in an old-timey tin with vintage calligraphy and supersweet flavors. They had a certain Holly Hobbie flair, and would also have been right at home with Laura Ingalls on the prairie. If, you know, Laura had used mass-produced cosmetics. The tins also clicked in a pleasing way (watch the brief and informative video from Laura’s Last Ditch below for a reminder) when you slid them open and closed. 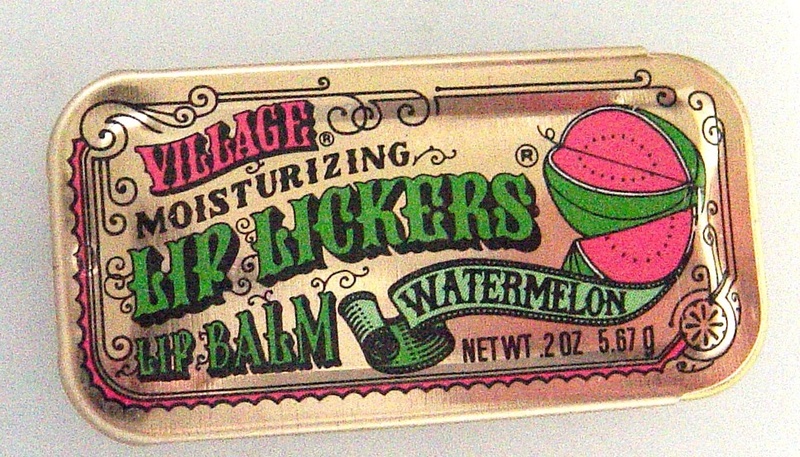 Village Lip Lickers had a nice tactile quality when you applied them with your fingertip, but in retrospect, it probably wasn’t the most sanitary kind of lip gloss to use in an elementary school. (Gross.) Anyway, I had the root beer variety and LOVED it. I remember it being very soft in the tin, not terribly glossy, deliciously flavored, fabulous smelling, and basically colorless. 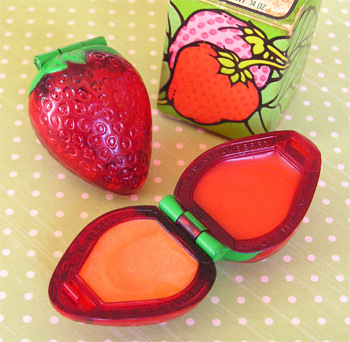 Special lip glosses were perfect stocking stuffers, good grade rewards, and surprise treats. Like any glamorous grown-up woman, we didn’t want to leave the house without our favorite lip products tucked safely into our purses. 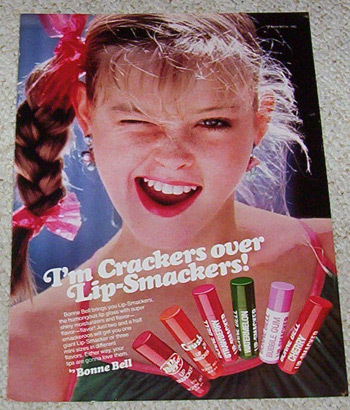 Girls’ lip glosses were light on the color but high on the flavor and shine, which is just how we liked it in grade school in the 1980s.